John Babiyan, also known as Canadian/Lebanese/Armenian - John, a neighbor from Moran St played for us his harmonica after a delicious dinner at Design 99's Gina and Mitch house on Klinger St. Click here to see a short movie of his concert. Chicago-based architect Daniel Berry brought us today to the Catherine Ferguson Academy which presents a success story in the Greening of Detroit undertaking. The Academy is located in an area northwest of Woodbridge. The school, which is simultaneously a big urban farm, provides high school education to girls, with a focus on agriculture. 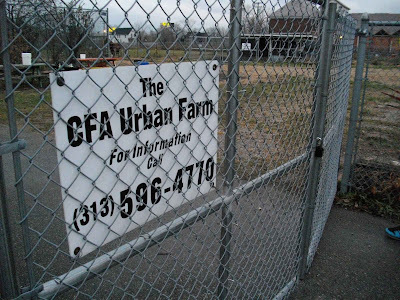 They keep chickens, goats, horses and other animals right in the center of Detroit. Architect and artist Marjetica Potrc, who is also doing a guest lecture at the Dutch Art Institute on 13 January 2009, worked with the school in 2005. 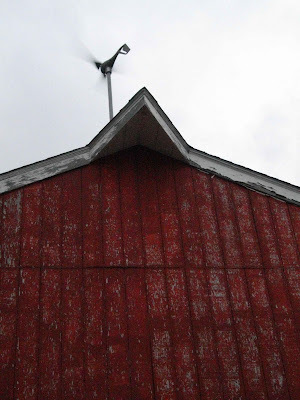 She built with the students of the Academy an energy windmill for the farm, which is functional until now. With this intervention Portc won the Nobel Peace Contest. Click here for the Metro Times article covering the story. Yesterday, artist Scott Hocking took us for a tour through the city. Scott does installations, paintings, collage art and he does also photography. 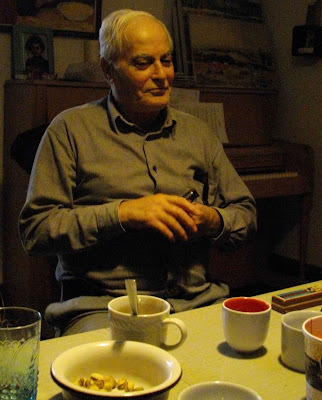 Part of his work was exhibited at the Heartland exhibition in the Van Abbemuseum in Eindhoven. He took us along the old factory building in which he has built his Ziggurat pyramid installation. He commented on how being in a factory plant by all bij himself felt like being in nature. 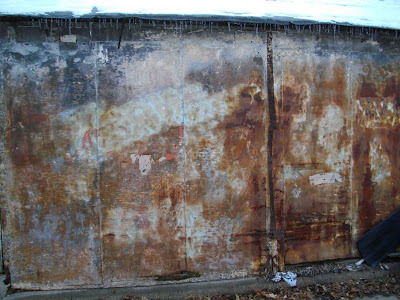 After his art piece Ziggurat got published about in several magazines, someone fenced off the building. The rumor is that an film studio is to be realized in the building. 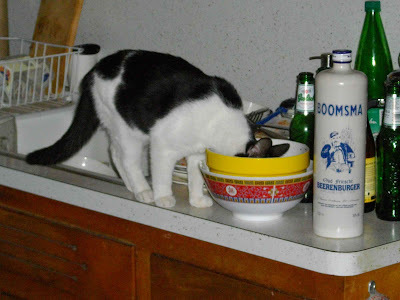 Scrapping and scavenging is part of Scott's practice. 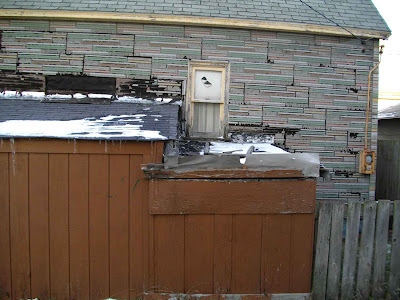 His studio, which is an old factory building downtown, is filled up with materials he found during his walks in Detroit. 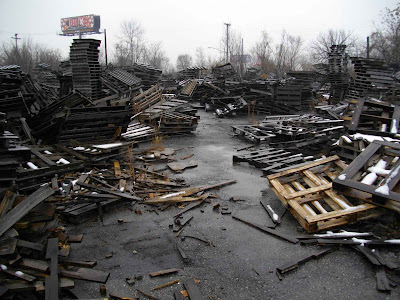 And although, he mentioned not being too much into scrapping anymore, he found several nice pieces during our tour. 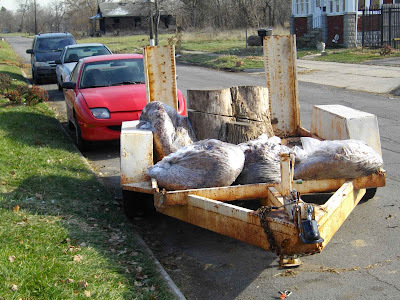 Scrapping and scavenging in Detroit is done in small and large quantities, scrappers work both with shopping trolleys as well as with pick-up trucks. Especially scrapping metal is of great interest to the people who are into this business since the revenues are relatively high. Scott says he meets many nice people on his tours. And with the exceptions he can always reason. 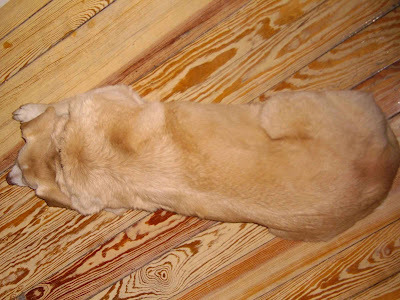 He is afraid of the wild dogs who live in the buildings though. Detroit is very much a car city: the streets are wide and the city is very spread out. Yet, Scott is often walking or cycling into quarters which are unfamiliar to him. As an results he makes much easier contact with the local people who are living there. Farnsworth Community Garden, at Farnsworth and Elm WD ST.
Kevin Bingham's Farm at Parkhurst and John R ST. Compiled by Mitch Cope and Gina Reichert. Babson, Steve et al, Working Detroit. The making of a union town (Detroit 1986). Bak, Richard, Detroit 1900-1930 (Charleston 1999). Banning, Robert, The seed thieves (Grosse Point Farms 2006). Clark Jeff, The little door slides back (New York 1997). Conot Robert, American odyssey. A unique history of America told through the life of a great city (New York 1974). 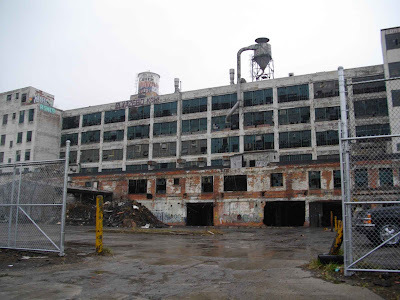 Cope, Mitch and Lynn Crawford, Detroit, i.e. 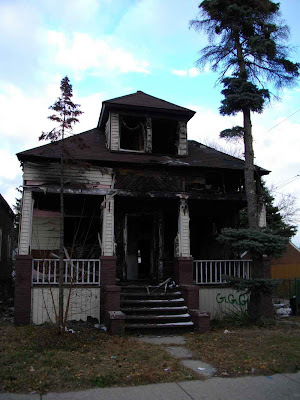 (Detroit 2006). 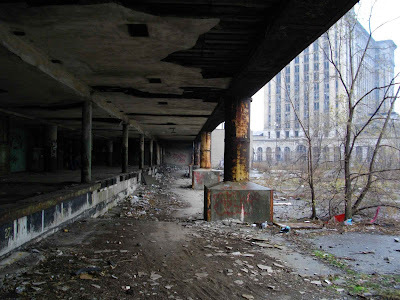 Crawford, Lynn, Detroit: Imaginary cities (Detroit 2007). Crawford, Lynn, Simply seperate people (New York 2002). Darden, Joe T. et al, Detroit. Race and uneven development (Philadelphia 1987). Eckert, Kathryn Bishop, Cranbrook. The campus guide (New York 2001). Eugenides, Jeffrey, Middlesex (New York 2002). Fisher, Chris C. and Allen T. Cartier, Birds of Detroit (Renton, Edmonton 1997). Jacobs, Jane, The death and life of great American cities (New York 1992). Gavrilovich, Peter and Bill McGraw, The Detroit Almanac. 300 years of life in the motor city (Detroit 2000). Hawkins Ferry, W., The buildings of Detroit. A history (Detroit 1980; revised edition). Hersey, John, The Algiers Motel incident (Toronto et al 1968). Hume, Christine, Alaskaphrenia (Kalamazoo 2004). Kavieff, Paul R., The purple gang. Organized crime in Detroit 1910-1945 (Fort Lee 2000). Kowalski, Greg, Hamtramck. Soul of a city (Chicago 2003). Oswalt, Philipp and Tim Rieniets, Atlas of shrinking cities (Bonn 2006). Oswalt Philipp (ed. ), Shrinking cities 1 International Research (Bonn 2006). Oswalt, Philipp (ed. ), Shrinking cities 2 Interventions (Bonn 2006). Poremba, David Lee, Detroit 1930-1969 (Charleston 1996). Powell, Mark Alor, Very important person (Mexico 2006). Sugrue, Thomas J., The origine of the urban crisis. 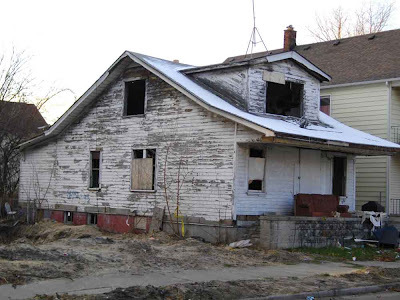 Race and inequality in postwar Detroit (New Jersey 1996). Vergara, Camillo Jose, American Ruins (New York 1999). Waldheim, Charles, Hilberseimer / Mies Van Der Rohe. Lafeyette Park Detroit (Munich et al 2004). Weisser, Annette and Ingo Vetter, Arbeiten 1996-2006 (Munster 2006). 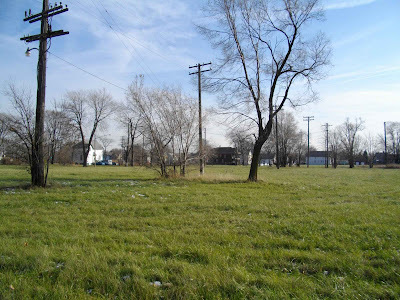 Woodford, Arthur M., This is Detroit 1701-2001. An illustrated history (Detroit 2001). Wylie, Jeanie, Poletown. Community Betrayed (Chicago 1989). 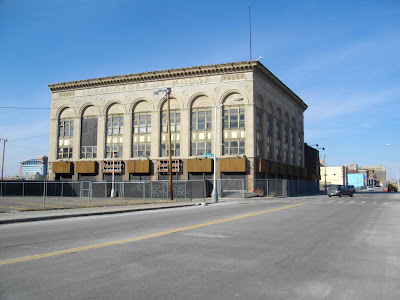 The biggest second hand bookstore in Detroit, and far beyond I guess, is to be found at 901 W. Lafayette Boulevard. John King himself built up this huge book emporium and he recruited very nice staff, as well. Five stories of books, books, books..on every possible subject you can imagine. 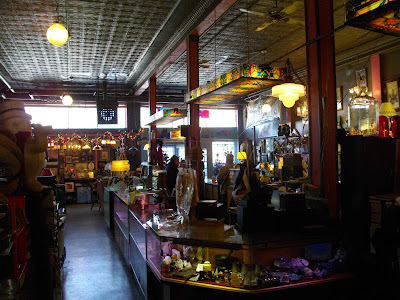 If you can’t find it yourself, the people in the store will help you chase it down. All the aisles have overhead lights you can turn on and off to give some extra visibility to your search. I almost got myself a big pile of books, including books on Science Fiction with a very nice contribution of Hakim Bey, a book on Michigan plants, a little booklet with lumber information from the 1920’s and poems from Allen Ginsberg. In the end, I diminished my stack to two books on Detroit, which was of course why I came here in the first place. The titles I found are Devil’s Night and Other True Tales of Detroit by Ze’Ev Chafets and God Squad by Walter Wagner. The last one is an odd little book from 1979, with as subtitle: the drama of the Detroit police chaplains corps trying to use God where guns have failed. I will keep you posted on how that worked out. 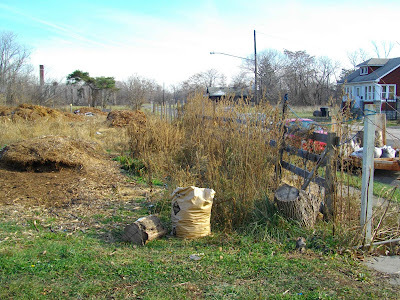 You are thinking of getting into urban farming? Build your own little Detroit Datcha? Start an archeological dig or an urban campsite? 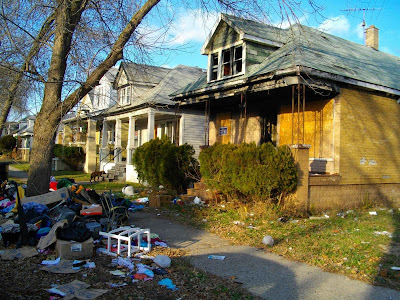 Now on offer, a beautifully cleared plot in one of the densest neighborhoods of Detroit, just on the edge of vibrant Banglatown. 250 square meters of sheer opportunity. Unrealtors Eric Deuweke, Mitch Cope, Gina Reichert, Andrew Hersher, Femke Lutgerink, Christian Ernsten and Joost Janmaat today engaged in their first unreal estate survey in Mitch’s and Gina’s neighborhood. 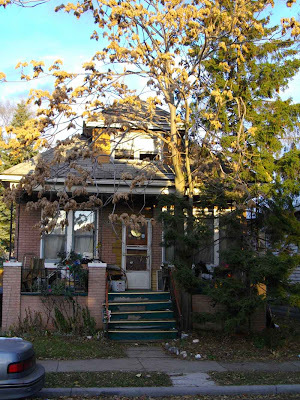 We found a number of properties that solicit ideas and project that can put them into alternative use. 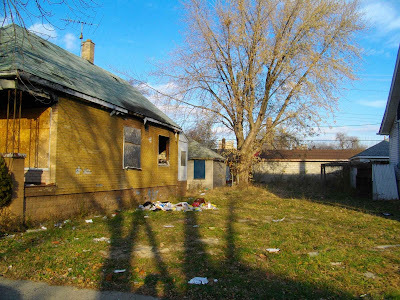 Along the short stretch of Klinger and Moran streets we surveyed there were a number of vacant lots (either owned by the Michigan Land Bank, the county or the city), some five burned down properties, and a number of houses that were boarded up and/or into foreclosure. Design 99 prepared a nice map of their neighborhood that gives a clear overview of the real estate situation. Just off the map, to the south on Moran Street, we found a 30 meters stretch of street that accommodated the various typologies of Detroit’s real estate market come together: an empty lot, a burned out house (occupied by a young stray pit bull terrier) and a foreclosed house crammed in between two occupied houses. 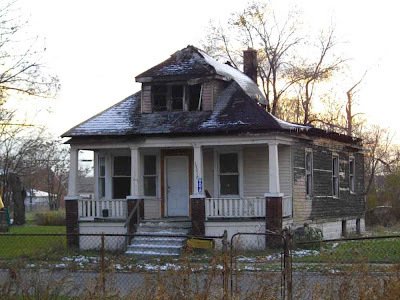 This seems to us a perfect start of the Detroit Unreal Estate portfolio. 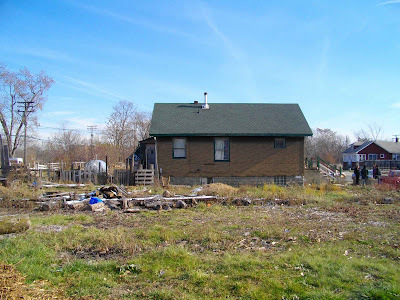 What new opportunities and prospects can be developed onto these properties? What new ways of forward thinking, value attribution and new usage can it provoke? Our ambition over the next few months is to have our graduate students from the Dutch Art Institute, Michigan University architectural students, local and international artists, neighbors and others develop ideas, plans and projects on these different sites. These and some of the other 90.000 vacant plots and thousands of foreclosed homes will be on Public Auction next January. A vintage store on Woodward Ave, close to Petersboro St.
Street sign on Woodrow Wilson Street. An empty building in downtown Detroit. 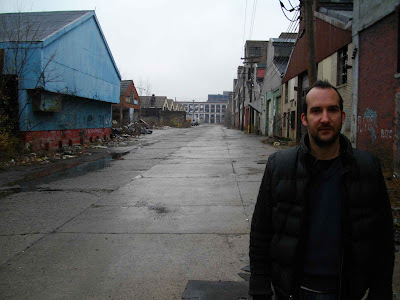 Yesterday, Design 99 - Mitch & Gina introduced us to Toby Barlow, a Detroit-based writer. 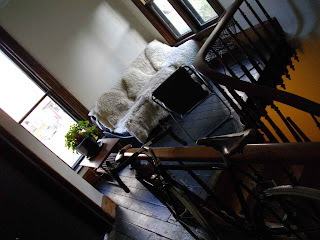 Toby lives in a beautifully re-done townhouse in Lafayette Park, a residential area designed by Ludwig Mies Van Der Rohe in de center of Detroit. This witty guy wrote a well-acclaimed fiction novel called Sharp Teeth, yet at the same time he is working for JWT, and in this role, he is the head of advertisement department at Ford. 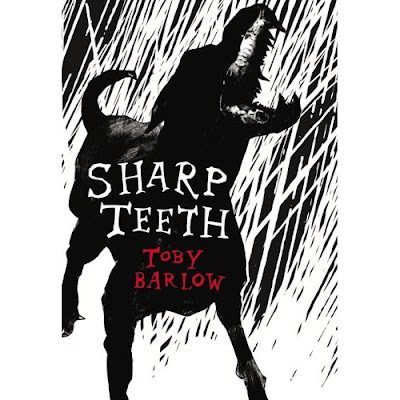 Click here for an animated version of Sharp Teeth. In the article below published in The Michigan Citizen, activist Grace Lee Boggs comments on Obama's victory in the race for the presidency. She argues that the next step in 'living for change' must be, amongst others, to re-examine the Fordist - model in schooling by taking for example the Catherine Ferguson Academy in Detroit as a best case scenario for a more applicable form of education in the city. 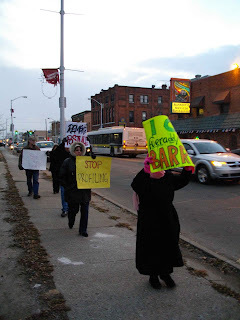 It was block by block, from the ground up, community organizing. which won the White House for Barach Obama. Inspired by his eloquence and audacity, his commitment to change we can believe in, and his faith in himself and in human possibilities, determined to leave behind us the shameful legacy of slavery, Jim Crow, the Iraq war and the other atrocities of the Bush- Cheney regime, and to begin healing and redeeming our country and ourselves, tens of thousands of Americans, of all ages, ethnic backgrounds and faiths, members of unions, churches, synagogues, peace, women’s and other community groups, discovered in them/ourselves the energy that comes from renewed hope and commitment to a just cause. So, especially after the Democratic convention. we/they went door to door, block by block, in neighborhoods all over the country, persuading strangers and folks who had never voted or who had lost faith in voting, to vote for Obama. It was a great feat, worth celebrating. I will not be among them. I think that Obama has already done our country a great service by encouraging tens and hundreds of millions all over the world to believe that America can change and that together we can change it. I do not delude myself that despite Obama’s formidable multi-tasking skills, he will be able, in the Oval Office, as commander in chief of the U.S. Armed Forces, struggling to extricate this country from two unwinnable wars which have become occupations, saddled with a trillion dollar deficit, and needing to court both Republicans and Democrats even for modest health care legislation that will not make us more healthy but only make heath insurance more available, to initiate the profound changes in our values, in how we live, how we make our livings and how we educate our children, that are urgently needed at this milestone in our evolution when we are in the midst of a cultural transition as far-reaching as that from hunting and gathering to agriculture eleven thousand years ago and from agriculture to induntung ustry three hundred years ago. Changes of this magnitude cannot come from the top down, only from the ground up. .
And that is where they are coming from. All over the country citizens from all walks of life, parents, teachers, administrators, recognizing that our Fordist model of schooling is the main cause for school dropouts and expanding prisons, are exploring new ways of educating our children that involve their hands and hearts and engage them in community-building. One outstanding example is the Catherine Ferguson Academy in Detroit where caring for small animals and planting community gardens is part of the science curriculum for teenage mothers . 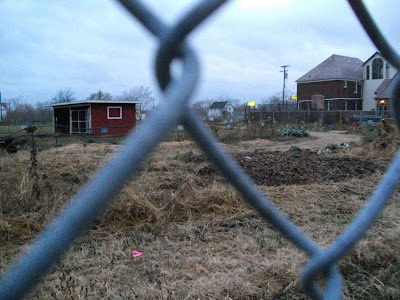 In Milwaukee former basketball player Will Allen has founded Growing Power, an urban farm that not only grows produce for thousands of city-dwellers but helps communities grow their own gardens in order to bring the neighbor back into the ‘hood. "We have to go back to when people shared things and start taking care of each other. That's the only way we will survive. What better way to do it than with food?" said Will as he was honored with a 2008 MacArthur Genius Award. All over the United States the local foods movement is helping Americans cope with spiraling food prices, at the same time slowing down global warming and making us healthier because we are not importing adulterated foods grown on factory farms and transported thousands of miles in gas-guzzling trucks. 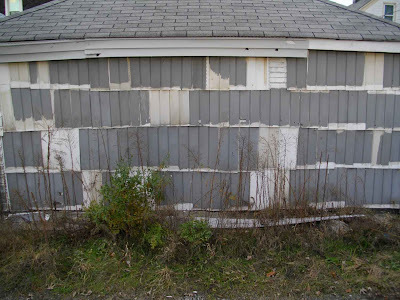 In neighborhoods all over the country the economic meltdown is forcing people to rethink the waste of suburban living and SUVs and the cost of shopping at malls rather than neighborhood stores. So this Thanksgiving people will be swapping stories of an older generation whose hands were more calloused but who cared not only for themselves but each other. At the end of 1966, four months before his anti-Vietnam war speech, Martin Luther King Jr. wrote “Where do we go from here: Community or Chaos” in which he called for a radical revolution of values against the giant triplet of racism, materialism and militarism. It would be fitting if on January 20 as we celebrate Barach Obama’s inauguration we also commemorate MLK’s 80th birthday by holding teach-ins on this little pamphlet. As we woke up to a beautiful sunny winter day, we set out for a planned-unplanned drive through the city. We aimed for the T-Ford factory (a now dilapidated factory that ran the world's first conveyor belt, and therefore can be seen as the birthplace of modern industrial production), Grosse Point (a town bordering Detroit to the northeast; in a matter of meters, the battered-up last houses of Detroit give way to fabulously rich mansion) and Mexican Town (in the southeast), but detoured into many other neighborhoods. 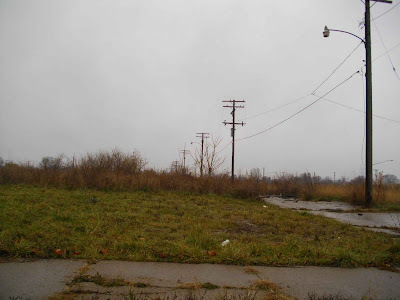 After the relative denseness and beauty of Hamtramck, we got a taste of the desolate and ruinated. Making our way through the neighborhoods just south of eight mile was a pretty disturbing affair. Lots of empty lots, lots of burned down, boarded up or ruined houses. 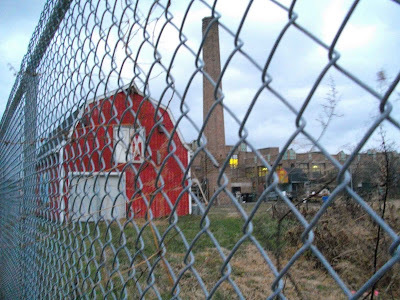 Closed stores, ruined factories. Although we set out to go beyond the spectacle of the ruination and the places of catastrophe, it was pretty compelling nonetheless, and a just reminder of the dire state the city is in. 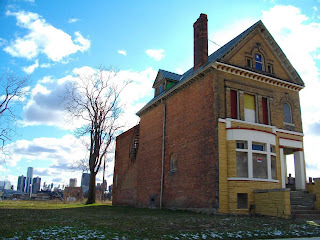 Turning back onto Woodward Avenue, Detroit's spinal route, we stopped at an odd collection of grand buildings. Sitting in the middle of grassy nothingness, they turned out to be the Police Headquarters, the Fire Department and the Court House of Highland Park, one of the most heavily affected parts of town. The mail on the doorstep of the wide-open entrance to the Court House suggested the place had been vacated in 2004. The inside was a mess. Apart from police paraphernalia, we stumbled into a bonanza of files. The basement was literally paved with thousands and thousands of financial records and slips. 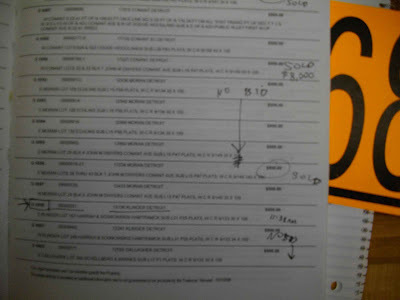 Other floor were strain with records of cars took into custody, complete with Polaroid’s of the most outrages vehicles. And boxes and boxes with mug shot files. 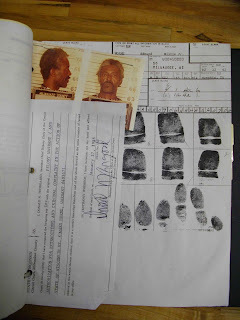 The whole criminal record of the area lay bare: a deep look into one of the most important infrastructures of the state. Then we went to Corine Smith’s place, a wildly beautiful townhouse in Mexican Town, where she showed us some recent photography. 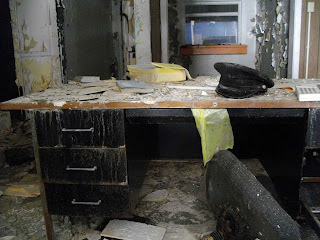 As a photographer in Detroit she decided not to focus on the ruin in the city, but on opportunity and beauty. Resulting in a very powerful series on urban ecology. Wide panoramas or intimate enclosures of green, with only scant and very subtle references to the urban environment. Apart from being highly esthetical, they told stories of loss, radical change and renewal; from the little garden inside the brick walls of a church to the wild grass planted to cleans the polluted soil. Finally we discussed some of the pillars of the project. Since we agreed on the curatorial line, there are still a number questions that need to be answered. What sites will we acquire in the area? How do we engage the neighborhood? What initiatives, ambitions and agenda’s do we hook up with? What projects do we solicit from our students? How do we program the two weeks in April? 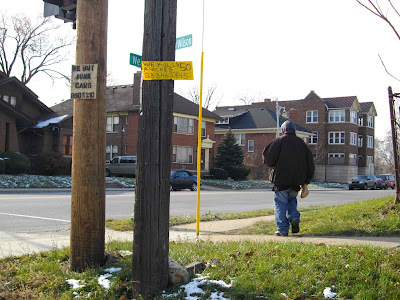 Gina and Mitch work and life mostly in the area between Conant, Caniff and Davison Streets and Chrysler Freeway. 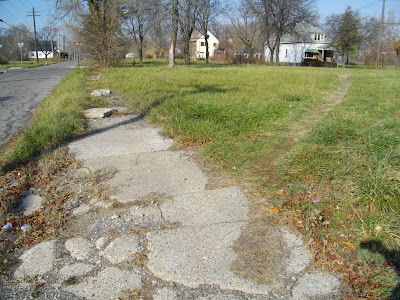 This is, in terms of Detroit (or Hamtramck), quite a densely populated area where it's possible to walk around easily. The city quarter is a nice mix of people, there are folks from Bangladesh, Poland, Lebanon and other places. Design 99 storefront on Caniff St. The Power House on Moran St. The couple is improving and renovating their own house, which is an old Polish deli formely inhabited by a Bangladeshi family. 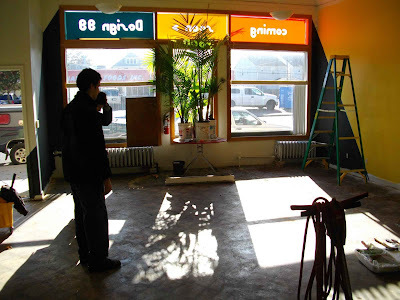 Besides that they're also working on the Power House project for a sustainable community and their Storefront. Moreover, Mitch is watching two houses in the direct vicinity of their own house which are vacant. 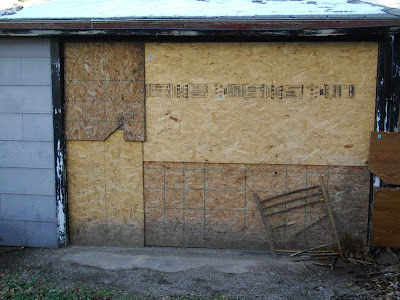 He boarded them up and ask to neighbours to help him with preventing break ins. Gina + Mitch at Klinger St. Directly next to their house they recently obtained another house for only 500 dollars. 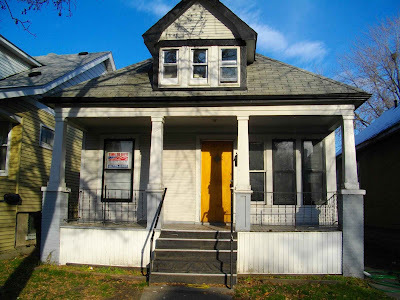 This building is being renovated now as well and will be inhabited by Corine and her husband Zeb Smith, who are friends of Gina and Mitch. Besides these two couples also artist Graem White and his girlfriend are living in this part of town. 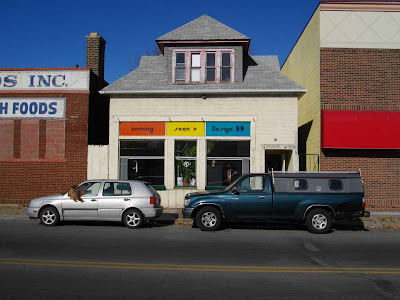 Graem worked with Mitch in the Tree of Heaven Woodshop and then artist and photographer Scott Hocking thinks about getting himself a house in the neighborhood. 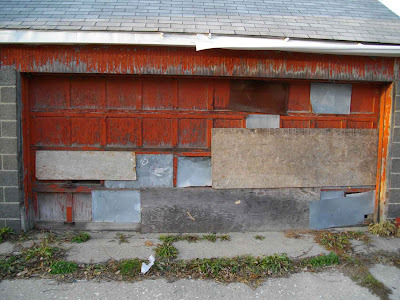 Walls of houses and garages at Moran, Klinger, Gallagher and others Streets. 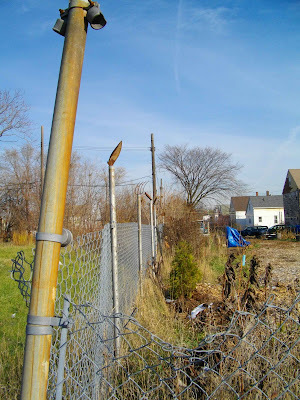 Gina, Mitch and photographer Corine Vermeulen-Smith walked us through the Detroit area next to Hamtramck this afternoon. 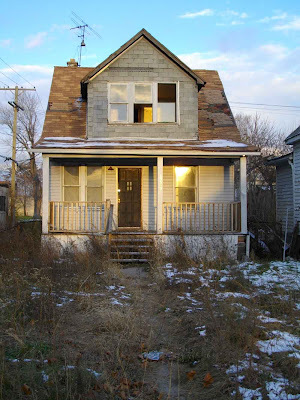 Corine just bought the house next to Gina and Mitch's on Klinger St. Hamtramck is a seperate city more or less encapsulated by Detroit. During the walk and afterwards we discussed the different individuals active in several sub scenes in Detroit, which could be of interest to the Unreal Estate project. ADULT. a techno group based in Detroit. The Detroit techno scene is especially well connected to the crowd in Berlin. But ADULT has relations as well with folks in Rotterdam. 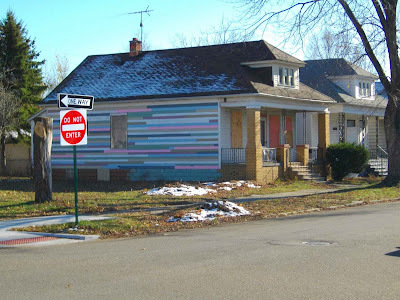 Jerry Heron, author of Afterculture: Detroit and the Humiliation of History and contributor to Stalking Detroit and Shrinking Cities would be the right person to talk to regarding the history of the city. Another central figure would Grace Lee Boggs, a black power activist, who is currently connected to Michigan Citizens newspaper. And Ed Gardiner is the person to discuss the Detroit Film scene. Gardiner is involved with the Film Office. 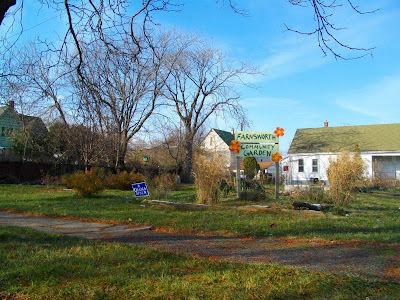 The Garden Resource Program Collaborative and people like Kevin Bingham are the best entries into urban farming activities in Detroit. 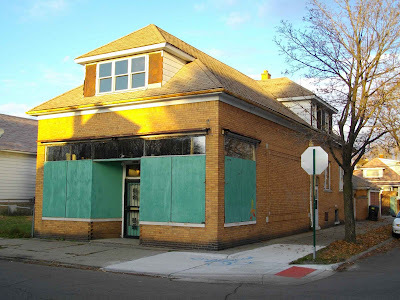 Then two projects we're mentioned one by Bill McGraw called Driving Detroit and another one by Liz Blondy & Claire Nelson - Claire owns a nice shop called the Bureau of Urban Living (next to Motor City Brewery) and their project is called Detroit Open City. A number of publications, booklets and leaflets piled up on the table in the end. 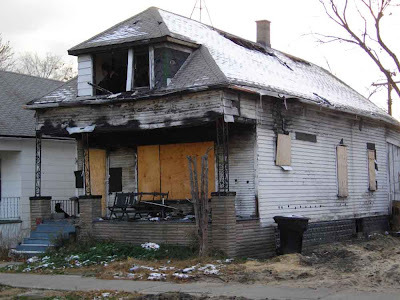 For example, Mitch was involved with INFRASTRUCTURE the first issue of DETROIT, i.e. 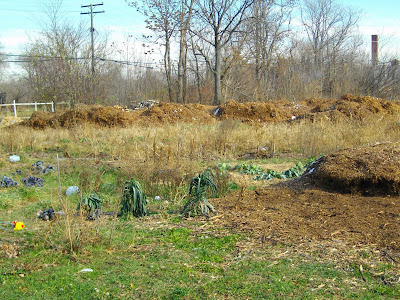 a collaborative project with the Museum of Contemporary Art Detroit (MOCAD), which includes amongst others an article by Ingo Vetter on urban agriculture. Then Toni Moceri was mentioned several times. She was the main researcher in the Detroit part of the Shrinking Cities project, but currently county commisioner for Warren.